Ifield Watermill is on the site of an earlier corn mill, known to have been in operation by 1660, but which burned down and was rebuilt in 1683. The current building dates from around 1817, and was in use until corn milling ceased in the late 1920s. The building was derelict until around 1970, when restoration work was begun by a group of local admirers. 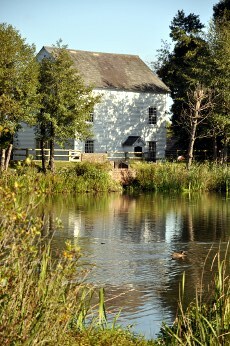 Ifield Watermill is administered by Crawley Museum Society, which also runs the Crawley Museum Centre in the town centre. The mill now contains 4 floors of exhibitions related to the history of the mill and milling, the local iron industry, and local agricultural history. Ifield Watermill is open to the public between 2.30pm and 5pm on the third Sunday of the month between April and September, as well as on National Mills Weekend, which is normally in May. Admission is free, although donations are welcome. The watermill has toilets, plenty of free parking (turn left immediately after leaving Hyde Drive), and disabled access to all 4 floors.